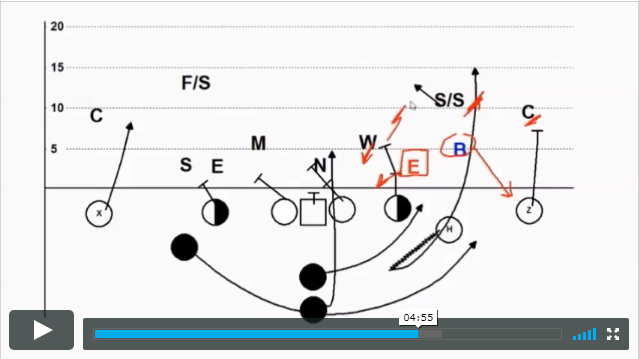 In a video recorded for Option Central, Coach Mike DiMatteo presents a Jet Option series that includes 4 plays. Starting with the base Jet Option play from an Empty formation, and incorporating a QB Counter Trey action away from the Jet, Dimatteo then takes us through three complementary Play Action passes off the same action. With the Jet/Option, Smoke, Inside Switch and Outside Switch routes, the series has an answer for rotational coverages and edge blitzes, along with a simple, built-in RPO. Available now in our Members Article and Resource Library. 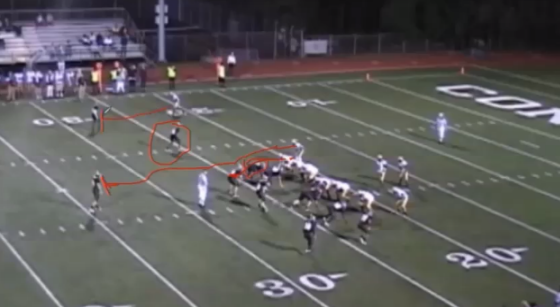 In the last two Chalk Talks from the Triple Gun Virtual Playbook Volume VI:The Gun Triple, Coach Tony DeMeo illustrates the Gun Triple vs. a 3-4 Defense. In Volume 58, Whirley motion gets the Secondary moving the wrong way - the pitch key backs off and the Safety gets so deep that he takes himself out of the play, creating an easy arc block for the slot, resulting in a big play for a touchdown. In Volume 59, the play is Flip Triple - a complementary play to the back side in which the Slot becomes the dive back and the Tailback becomes the pitch back. 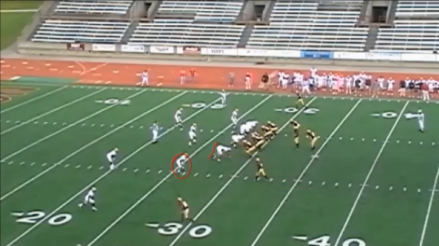 A collaborative effort between Option Central and DeMeo, The Triple Gun Virtual Playbook Volume VI includes a total of 16 Gun Triple plays like these. Members can view 10 of the plays in Play of the Day Chalk Talk format in our video resource library. The full collection of plays, including these and 6 additional plays are included on the Triple Gun Virtual Playbook DVD, which is available for purchase at Coach DeMeo's web site. In another Play of the Day Chalk talk from the recently released Triple Gun Virtual Playbook, Coach DeMeo illustrates the use of the Wing Over Formation (an Unbalanced look) to gain leverage on a 4-4 Defense. This play uses an extra lineman to move the handoff key wider - creating an easier read for the QB. Easy blocks for the Slot and Split End and a numbers advantage to the wide side of the field, result in a big gain on the pitch component of the play. Available now in our Members Video Library. In this Chalk Talk, Coach DeMeo illustrates the Gun Triple once again vs. a stemming 4-4 Defense. With the Defense stemming constantly all game to counter the Triple Gun's Smart Splits, a good cutback coupled with the Triple Gun's simple blocking scheme combine for a long touchdown on the Dive component of the Triple Option. Then, in a different play in the same game the QB Keep component of the Option goes for a long gain. All in all, a tough day for a stemming Defense. In this pair of Chalk Talks, Coach DeMeo illustrates the Gun Triple vs. a 4-4 Defense. 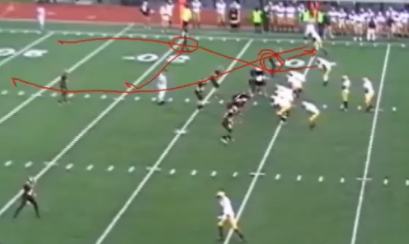 In Volume 54, the front "stems" as a counter to the Triple Gun's Smart Splits, and in Volume 57, the play is run from what Coach DeMeo refers to a Pro Set (some defensive coaches will label this "Ace Wing" - a 2 TE look with a Wing on one side and a Flanker on the other). Coach DeMeo uses this formation to stretch out the front, create bigger "bubbles" and move the handoff key away from the Dive. Both are available now in our Members Video Library. A collaborative effort between Option Central and Coach Tony DeMeo, the latest edition in the Triple Gun Virtual Playbook Volume VI focuses entirely on The Gun Triple - the core play of The Triple Gun Offense. Play diagrams and game video for a total of 16 Gun Triple plays are accompanied by narration and telestration as Coach DeMeo takes you through each variation of the play that is designed to be run 25 to 30 times a game. Listen and watch as one of the great teachers of the game explains and illustrates the details of executing the Triple Option from the Shotgun. You'll learn how to use formations to get the look you want.. putting defenders in a bad position, and how various motions create “head-start” & destroy tendencies that can be exploited. Also included is how to handle a stemming defense, using Counter Triple Options to get blocking angles on LBs and why the Triple Gun "Flash Pass" is always the QB’s first option. Coach DeMeo's Triple Gun Virtual Playbook DVD series now includes 6 volumes, including The Triple Gun Overview, The Triple Gun Double Options, The Triple Gun Quick Game , The Triple Gun Jet Sweep series, The Triple Gun Play Action Pass Game and The Gun Triple. In this Chalk Talk, Coach DeMeo illustrates the use of the Wing Over Formation (an Unbalanced look) to force a 4-3 Defense into a 6-1 look, creating easy blocks for the Slot and Split End and a numbers advantage for running the Gun Triple to the wide side of the field. Available now in our Members Video Library. 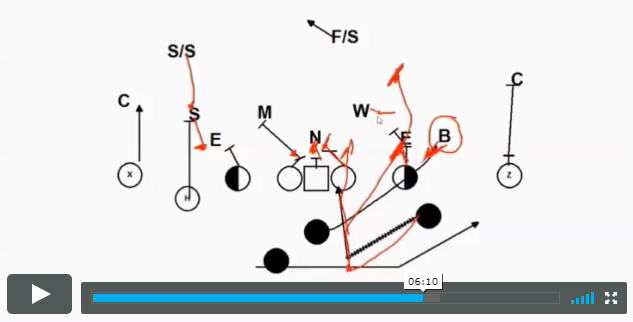 In this Chalk Talk, Coach DeMeo illustrates the use of the Slot Formation to unstack a 4-3 Stack Defense to create an easier read for the Quarterback. Available now in our Members Video Library. Two more Chalk Talk videos in our Gun Triple series illustrate the option play being run from an Empty Set. In Part 1, the Option attacks the 3 receiver side, and in Part 2, the 2 Receiver Side. Shown against a 4-3 Defense, these Chalk Talks illustrate the difficulty presented to the Defense by the use of the Empty Set combined with motion. Watch and listen as Coach DeMeo points out the design of the play, coaching points, blocking assignments, and the defenders that either take themselves out of the play or create an easy block. Available now in our Members Video Library. Coach Tony DeMeo is back at the digital chalkboard for Play of the Day Chalk Talk Volume 50. In this, the first in a new series that focuses on the Gun Triple - the core play in the Triple Gun Offense, we take a look at the play against a 4-3 Defense from the base Double Slot formation. Other videos in the series will illustrate the play against various fronts and a variety of formations and motion. Complementing the Triple Gun Quarterback Drills video, Indoor Drills is a 2 part series in which Coach Tony DeMeo conducts a two day instructional clinic in a Wisconsin Indoor facility for a High School Quarterback. Packed with Techniques, Fundamentals and Coaching points, this 49 minute series is applicable to any offense. Working with a fleet of College level receivers, DeMeo takes the young quarterback through a series of individual drills, covering Quarterback (and even some Receiver) mechanics, and then progresses to group drills for reading the Fade/Stick, Slice/Seam, Slice/Corner and "In" routes. The series concludes with "rapid fire routes" that include the Hitch, Fade, Slice, In and Out routes from the Triple Gun Offense. Recent additions to our Member Video Library include Triple Gun Quarterback Drills and The Triple Gun Pass Game. Triple Gun Quarterback Drills includes individual, group and team drills featuring live footage of Coach Tony DeMeo working with High School Quarterbacks in a practice setting. The Triple Gun Pass Game - a series of 4 cutups from a 2 hour clinic presentation that was recorded at the McNally Football Retreat in Indianapolis, IN (2012) complements The Triple Gun Run Game, a series of 6 cutups that have been available to our members since 2013. Topics in the Triple Gun Pass Game include Pass Game Principles, Quick and Play Action passing. The 2017 edition of the Mesh Point Option / Wings and Things Clinic is scheduled for March 24/25 at Columbia HS in Columbia, PA. The clinic offers two "tracks" to attendees and features an outstanding speaker list. Complimentary meals are included. A $10 discount for pre-registration and group/staff discounts are available. Full details are in the Clinic Brochure, or Contact Clinic Directors Anthony Sottasante (717-424-5840) or Dennis Iezzi (610-781-9787). Shown against a 3 Deep, 8 man front, Coach DeMeo talks and telestrates us through the Post-Wheel off the Gun Triple - specifically focusing on the 2 on 1 matchup that is created for the outside backer, who is a run defender first - responsibile for the pitch, who also must cover the wheel route on the pass. New to our Video Library is The Triple Gun Pass Game. Converted from DVD and divided into 4 parts for convenient online viewing by Option Central Members, this 2 hour clinic-style DVD presentation by Tony DeMeo was recorded in 2012 at the McNally Football Retreat in Indianapolis, IN. Listen to Coach DeMeo as he talks Pass Game Philosophy, the Quick Game with Route Concepts, and Play Action passing in his unique and entertaining speaking style.